On September 20, 2017, the Board of Immigration Appeals (BIA) issued a published for precedent decision in the Matter of Rehman, 27 I&N Dec. 124 (BIA 2017) [PDF version]. The case concerns determining whether a birth certificate that was not registered contemporaneously with a birth establishes a familial relationship by a preponderance of the evidence. The Board held that in determining whether such a birth certificate submitted by a petitioner establishes a familial relationship, adjudicators must consider the birth certificate itself, other evidence of record, and the circumstances of the case to determine if the petitioner sustained his or her burden. In this article, we will example the factual and procedural history of the Matter of Rehman, the Board's reasoning and decision, and what the new precedent means going forward. For an article on a related issue, please see our discussion of Matter of Ruzku, 26 I&N Dec. 731 (BIA 2016) [see article], which examined sibling-to-sibling DNA test results as evidence for establishing familial relationships. The petitioner, a United States citizen, filed a family-based immigrant visa petition for his brother under section 203(a)(4) of the Immigration and Nationality Act (INA). In order to establish that the beneficiary was his brother, the petitioner submitted the beneficiary's birth certificate. However, while the birth certificate indicated that the beneficiary was born in 1956, the certificate itself was registered in 1958. The Service Center Director adjudicating the petition denied it, finding specifically that the birth certificate submitted by the petitioner did not prove the beneficiary's parentage because it was registered two years after his birth. Additionally, the Service Center Director found that the petitioner had not submitted sufficient secondary evidence to support the birth certificate in light of the delay in registration. The respondent appealed from the Service Center Director's denial to the BIA. The Board's task was to determine what sorts of factors should be considered in “assessing whether a petitioner has established a familial relationship by a preponderance of the evidence where a birth certificate submitted to prove the relationship reflects that it was not registered contemporaneously with the birth.” In short, the Board's question was in a case when a petitioner submits a birth certificate relating to the beneficiary that was not registered at the same time as the birth, what evidence would be required in order to establish the required familial relationship. In the foregoing subsections, we will analyze the Board's decision with each point in order. The Board explained that, in visa petition proceedings, the burden of proof rests with the petitioner. The petitioner must sustain his or her burden by establishing the claimed relationship to the beneficiary by a “preponderance of the evidence.” The Board recently applied this same standard in the family-based petition context in Matter of Ruzku, 26 I&N Dec. 731, 731 (BIA 2016) [see article]. 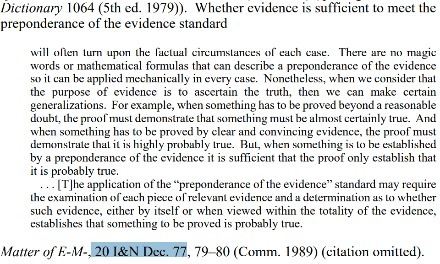 In Matter of Lemhammad, 20 I&N Dec. 316, 320 n.5 (BIA 1991) [PDF version], the Board quoted from the 5th edition of Black's Law Dictionary in defining “preponderance of the evidence” as “evidence which as a whole shows that the fact sought to be proved is more probable than not.” In short, this means that, in the visa petition context, the petitioner must establish that it is more probable than not that the beneficiary is eligible for the benefit sought. Regarding the issue in the instant case, the petitioner was required to establish that it was more probable than not that the beneficiary was, in fact, his brother. Matter of E-M- made clear that whether evidence is sufficient to meet the preponderance of the evidence standard in any specific case depends on the factual circumstances of the case. In assessing whether evidence meets the preponderance of the evidence standard, the question is whether the evidence establishes that the claim is, at a minimum, “probably true.” In assessing whether evidence establishes that a claim is “probably true,” the adjudicator may look at a piece of evidence in isolation or in the context of the totality of the evidence. The Board explained that, under regulations found in 8 C.F.R. 103.2(b) and 204(f)(1) (2017), a petitioner should submit primary evidence, if available, to establish a claimed family relationship in visa petition proceedings. Under 8 C.F.R. 204.2(g)(2)(i) (2017), in the context of establishing a sibling relationship, birth certificates showing a common parent is considered to be primary evidence. Primary evidence may be less available in cases arising from some countries than others. Accordingly, adjudicators are permitted to refer to the U.S. Department of State (DOS) Foreign Affairs Manual (FAM) Reciprocity Schedule in assessing what types of primary evidence may be available. Other evidence in the record may be considered if primary evidence is unavailable. The Board noted that the Service Center Director who rendered the decision against the petitioner in the instant case had issued “a pattern of decisions where [he] has determined that birth certificates registered 1 year or more after the birth are considered delayed.” The Board held that this standard has no basis in either the regulations or BIA precedent. The Board explained that, in its previous cases, it has “considered the record as a whole to determine where there is sufficient evidence of a relationship” in cases where the petitioner relied upon a delayed birth certificate. In both Matter of Bueno and Matter of Ma, the Board assessed delayed birth certificate cases. In Matter of Bueno, the petitioner relied upon a birth certificate that was registered 7 years after the birth of the beneficiary and 9 months prior to the filing of the petition. The Board concluded that additional evidence would be needed to establish the paternity of the beneficiary, and that an affidavit submitted by the petitioner was insufficient. In Matter of Ma, the petitioner submitted a Chinese notarial certificate issued 40 years after the birth of the beneficiary. The Board found that, while Chinese notarial certificates were generally reliable, the 40-year delay raised questions, and the Board concluded that the notarial certificate should be considered only in light of any supporting evidence that the petitioner could produce. Information regarding whether the document was based on facts that were contemporaneous with the birth or on facts that were more recently established. However, as we discussed, a delayed birth certificate may be evaluated in light of all evidence submitted by the petitioner in determining whether the petitioner sustained his or her burden of proof. This means that a petitioner may meet the preponderance of the evidence standard with additional evidence even in cases where the adjudicator determines that the delayed birth certificate itself does not establish a family relationship ship under the preponderance of the evidence standard. We will explore secondary evidence for such cases in the next subsection. The Board explained that in cases where the adjudicator determines that a birth certificate is not sufficiently reliable to establish a familial relationship by a preponderance of all of the evidence in light of all of the circumstances, the adjudicator should move to consider the secondary evidence submitted by the petitioner. This is outlined in 8 C.F.R. 103.2(b)(2). The Board explained that “[t]he regulations do not specify the secondary evidence to be considered in sibling petition cases like the one before us.” For guidance, the Board looked to the regulations in 8 C.F.R. 204.1(g)(2), which set forth the types of secondary evidence that a petitioner may submit to establish that he or she is a U.S. citizen or alien lawfully admitted for permanent residence. We discuss 8 C.F.R. 204.1(g)(2) in a separate and comprehensive article on site [see article]. The results of DNA testing conducted in a prescribed manner, as explained to the petitioner by the United States Citizenship and Immigration Services (USCIS). The Board stated that due to advances in DNA testing, the USCIS should encourage petitioners to pursue this option. Please see our full article on Matter of Ruzku for a case related to this subject [see article]. In cases where a delayed birth certificate is found to be insufficient for meeting the petitioner's burden, the Board took the position that the USCIS should provide a Request for Evidence with a detailed explanation of types of secondary evidence. The Board explained that the beneficiary's birth was registered when he was two years old. That made the birth certificate in the instant case less “delayed” than in the cases addressed in Matter of Ma and Matter of Bueno. Furthermore, the Board noted that, in the instant case, the petitioner filed the petition 52 years after the beneficiary's birth was registered, whereas in Matter of Bueno, the petition was filed only nine months after the beneficiary's birth was registered. Accordingly, the Board determined that based on these factors, there was a reduced risk of fraud in the instant case relative to the situation in Matter of Bueno. 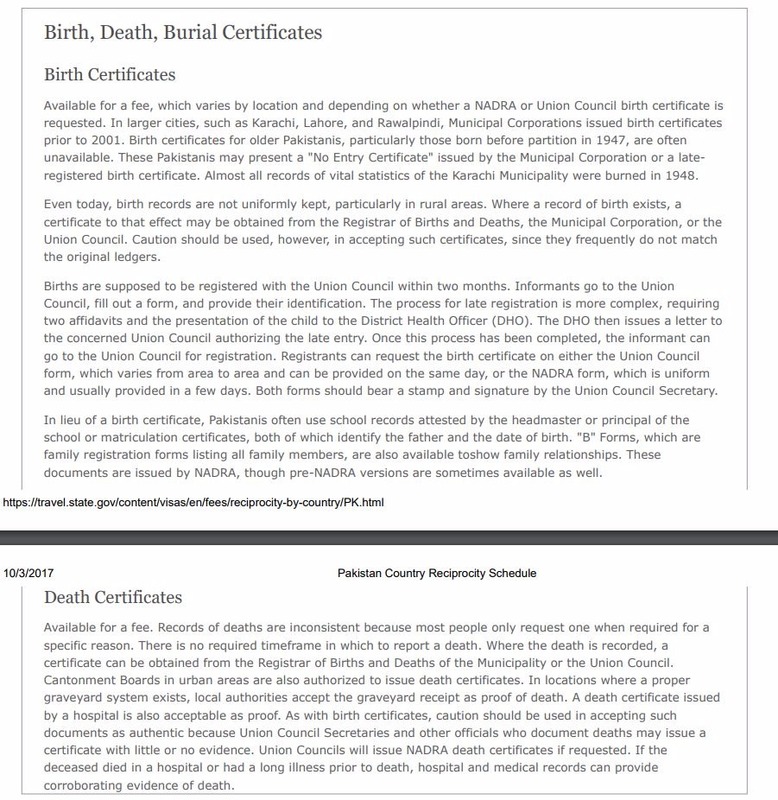 The Board noted that the FAM indicates that birth certificates for Pakistanis born shortly after 1947 may often be unavailable. 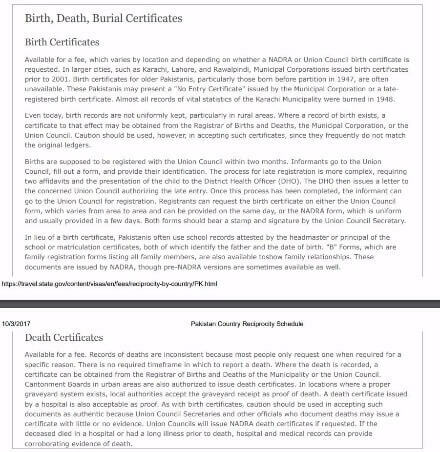 The Board stated that the Service Center Director should have weighed this fact in considering the persuasiveness of the beneficiary's birth certificate registered in 1958. The Board remanded the case to the Service Center Director for application of the framework set forth in this decision. The Board instructed the Service Center Director to consider secondary evidence if the Director determines that the birth certificate alone is not sufficiently reliable. When filing a family-based immigrant visa petition, the petitioner should consult with an experienced immigration attorney. An attorney will be able to evaluate all of the available evidence and determine how to best structure the immigrant visa petition based on case-specific circumstances.